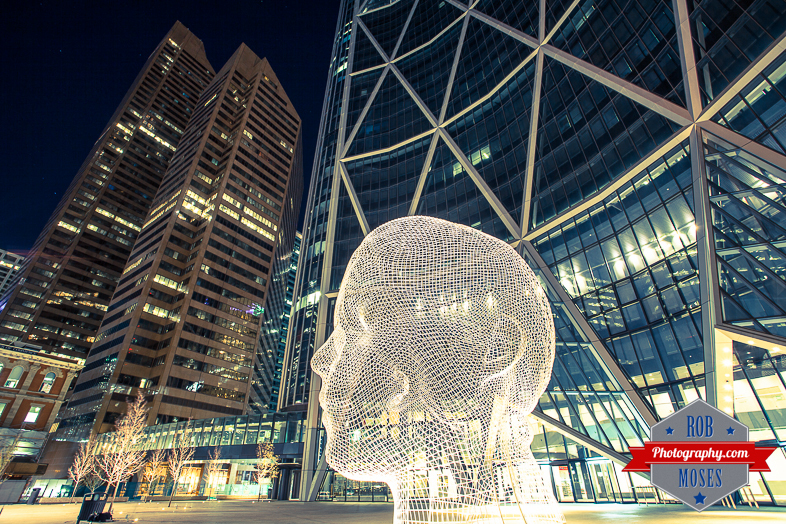 Calgary has a lot of public art and this massive head is one of my favourite. You can go inside of it, but you cant get one hand or foot onto it to climb with out a security guard running out to tell you there is no climbing! haha. If your ever in Calgary, it’s worth a look ;). This entry was posted in Cities and tagged 17-40L, 17-40mm, 5D mark ii, 5D2, 5Dii, Alberta, Art, artist, awesome, building, buildings, Calgary, Canada, canadian, Canon, city, City Life, cool, glass, head, iron, long exposure, manfrotto, metro, modern, night, photo, Photography, public, sky, skyscraper, skyscrapers, street, tripod, ultra, ultra wide, Urban, wicked, wide, wide angle, yyc, zoom. Bookmark the permalink. Impressive sculpture and photo. Great shot! Superb. That would be hard to capture well. interestingly unique…I’ve never seen anything like it before…awesome capture! Thanks! I didn’t shoot one from the inside, but plenty of other people have. As for lighting, all natural.